Just as a mother has an excellent opportunity to point up a feast day with special foods, so in Lent she can teach the discipline of fasting by her lack of fancy cooking. If a healthy penitential attitude is to grow with our children, it should be fed with their daily Lenten bread. For generations the human body has profited by the self-restraint of certain prescribed fasts. Giving up sweets never hurt any child; undoubtedly, it did their teeth a lot of good. If a young person once gets the thrill of being master of his desires, if he can take it or leave it, if he can deny himself in order to give to another, he has learned the lessons of Lent. But the mother can set the stage, or shall we say the table, so that this struggle with self can be fought bravely. Through sacrifice, Christians are made and Lent is a good time to begin. The Lenten menu becomes very simple and basic. It is built on bread, vegetables and eggs. Let us first speak of bread. It is a platitude to describe white bread as the staff of life. Consider the very start of life itself. Obstetricians instruct their patients to eat only whole wheat bread. But where is the mother-to-be to find such a thing? She won't find it at the corner grocery. There may be a health food store in a town of 100,000 which bakes a whole grain loaf at 23 cents, but that is not for the majority nor for the poor. The only other thing to do is to find a reputable miller who grinds whole wheat flour and try your hand at baking. We do not bake whole wheat bread because we like to be primitives or quaint. We know whole wheat bread tastes better and is better for health and growth The work entailed will benefit our bodies and souls as well. The word lady means "loaf giver," and as a giver of loaves she shows her love. The story of wheat and its renewal into real, honest, life-sustaining bread is an example of one of the most beautiful liturgical symbols. It is a work project in which all members of the family can share. All can rise to higher things along with the loaf during the Lenten season. 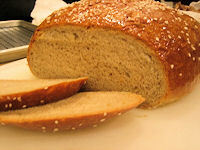 At any rate, this Lent try baking whole wheat bread for your family. Begin it as a penitential act, if you must, an act which may take you away from your bridge game. I'll be willing to wager that your family won't let you stop. Then in the morning when all your fast allows is dry bread, see how rich and good your own bake will taste. Your bread will be a staff of life to lean upon and not a cracked and crooked crutch. The recipe which we have found practically foolproof makes six good sized loaves. We bake this quantity, then wrap the excess and place it in the freezer. There the bread is kept as fresh as when it was first baked. Dissolve yeast in water for 10 minutes. Add yeast and remaining flour to the first dough. Knead and let rise until double in bulk. Knead again, shape into six loaves and put into 5 by 9 inch bread pans. Let rise until double in bulk. Bake at 350° for 15 minutes. Then turn the oven up to 400° and bake for 45 minutes or until brown.